Almighty and merciful God, may no earthly undertaking hinder those who set out in haste to meet your Son, but may our learning of heaven wisdom grain us admittance to his company. Through our Lord Jesus Christ, your Son, who lives and reigns with you in the unity of the Holy Spirit, one God, for ever and ever. “As the journey of Advent continues, as we prepare to celebrate the nativity of Christ, John the Baptist's call to conversion sounds out in our communities. It is a pressing invitation to open our hearts and to welcome the Son of God Who comes among us to make divine judgement manifest. The Father, writes St. John the Evangelist, does not judge anyone, but has entrusted the power of judgement to the Son, because He is the Son of man. “And it is today, in the present, that we decide our future destiny. It is with our concrete everyday behavior in this life that we determine our eternal fate. At the end of our days on earth, at the moment of death, we will be evaluated on the basis of our likeness or otherwise to the Baby Who is about to be born in the poor grotto of Bethlehem, because He is the measure God has given humanity. The feast of St. Juan Diego, which is ordinarily celebrated today, is superseded by the Sunday liturgy. In Palestine Christians gather today in Jerusalem for the celebration of holy Mass. In Rome they proceed to the stational church "Holy Cross at Jerusalem" which serves to give the atmosphere of the Holy City. Why "Jerusalem"? Excavations of ancient sites often reveal a number of strata. When enemies destroyed a city, a new one would rise on the same location, so that today there are several layers of remains, one city, as it were, above the other. Our Jerusalem likewise has four strata. The bottommost layer is the Jerusalem of the Jews, that venerable land where the Lord Jesus began His mission of redemption, where He suffered and died. This is the historical Jerusalem so dear to us Christians. 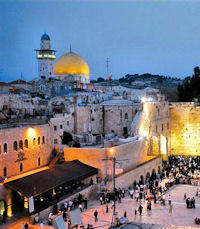 Anyone making a pilgrimage to the Holy Land enters that ancient city with holy awe. That Jerusalem, however, lies buried deep. For us another has been built upon it, the Jerusalem of Christians, God's kingdom on earth, the holy Church. This city still stands; it is the one which the divine King will enter at Christmas. Now we understand why we will hear so much about Jerusalem during the coming week. We should now clean and adorn our city, improving its streets and avenues through which the Savior will make His entrance. As a motto we should take the words of the precursor, St. John the Baptist: "Prepare the way of the Lord, make straight His paths; let every valley be filled, every hill be leveled." Holy Mother Church's message today is that the Savior is coming to the Jerusalem of the Christians, to the Church. Above the second stratum there arises a third, the heavenly Jerusalem at the end of time. Already now the Church sings of this Jerusalem. For during Advent we await the Savior who will appear on the Last Day to take all into "the new Jerusalem coming down from heaven." On Epiphany, the climax to the current season, the Church will cry out: "Arise, shine, O Jerusalem, for the glory of the Lord has risen upon thee." That is the goal. Today we must prepare for the great King's visit to our city. The whole coming week must be devoted to it. The Church prays: "Awaken our hearts to prepare the way for Your only-begotten Son that we may serve Him with purified hearts." In the time of the Roman Empire, rulers rode from city to city for the purpose of official visitations. Their appearance, called epiphany or parousia, was a great event, one preceded by months of preparation. Something analogous takes place in the Jerusalem of our souls. From a high watchtower we see the Lord coming afar off. 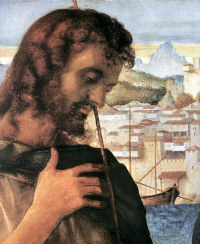 Suddenly John the Baptist appears; he hurries into the city to announce the King's approach. God condescends to manifest Himself to us in grace; but He demands the proper reception. The Epistle points to these interior and social aspects of the "Christ" way: interiorly, by prayer, to "glorify" the Fatherhood of God; socially by our actions, to "receive one another" in the Brotherhood of Man, "even as Christ has received you."